Cigar Roller Events are coordinated daily and can be coordinated for your Special Day. Cigar rollers for Dallas events have been in place and going strong since 2005 with corporate clients as well as consumer events making up the major portion of our clients. Now we have not only introduced Brides-to-Be but go as far into detail as to design custom cigar bands to be rolled on the cigars, and they event match the color of the Bridesmaid's dresses. 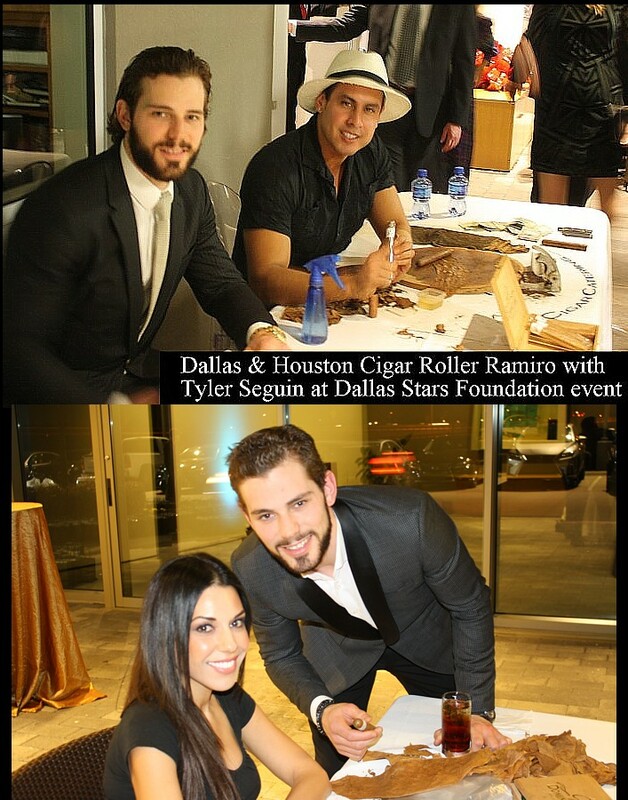 The Dallas Stars are just one of the top tier clients for the brand and Ramiro who is the resident cigar roller for DFW, Plano, McKinney, Dallas, Grapevine, Legacy and all surrounding areas is requested for his good looks and great presentation both for the brand and our clients. More cigar roller performance info can be found at our local site, Dallas Cigar Roller https://www.dallascigarrollers.com The cigar rolling feature creates the “bigger” visual and a more impressive feature for the affair while guests enjoy imported Dominican Cigars, not cigars made in Texas. Cigar roller events are available in 25 cities with Ramiro feature for Dallas and North Texas. Ramiro cigar knowledgeable and has been an asset to our brand and uses the same product imported from the Dominican Republic at each event. None of our cigars are made anywhere in the US, Ramiro roles the same premium cigars sold in stores. Presentation is one of the most important parts of our cigar roller performances. Many photos will be For years by clients especially in regards to weddings and other personal celebrations. CF Dominicana cigars use strictly grade one level quality tobacco, this level of quality cannot be found on a local level in fact, only brand-name cigars will have this level of quality. What does this mean for you? The cigars rolled at your event are imported unfinished to guarantee “shelf quality” construction in each cigar presented. The level of quality are perfect with a mild to medium body, especially when they are of the combination of Dominican filler tobacco with Connecticut Shade Wrapper. The cigars when presented at the event along with your cigar roller, cigar waitress and custom cigar bands commemorating the event, make for a lasting impression that your guests will remember long after the night is over. You don’t have to know anything about cigar rollers or cigars for that matter, simply contact us and let us know the details of your event with the contact link below, we will have a quote for you the following morning.Cigar rollers are available throughout Dallas however, each date is subject to availability, once the date is booked, our cigar rollers from out of town would be brought in with additional travel costs.